Whenever possible I like to use electric lawn power tools because maintaining multiple small engines and having to deal with storing extra gas is a pain but dealing with power cords can be a hassle too. Thankfully cordless outdoor power tools have gotten better over the years. After using a cordless grass trimmer I feel comfortable recommending them to others. In this article you'll find my thoughts regarding their use and benefits. Battery powered trimmers are not as powerful as either good corded trimmers or good gas powered trimmers. All tools have pros and cons and as long as you understand the limitations of cordless trimmers you'll enjoy using them. An 18v trimmer is the minimum you should consider to get a decent amount of power. If I were buying a new trimmer today I'd either get the Black & Decker LCC220 20-Volt Max Trimmer and Sweeper Combo Kit because it comes with the cordless blower for the same price as the trimmer alone or the Toro 51486 Cordless 12-Inch 24-Volt Lithium-Ion Electric Trimmer/Edger because the head rotates and includes a wheel guide so it can be used like a stick edger. The Toro 51486 is similar to the WORX GT WG150.1 in that regard except it's more powerful. The walk behind design of the Toro makes it easier to edge along walkways that are right up against buildings compared to the Black & Decker where you have to hold the shaft perpendicular to the edge. I've been using my cordless trimmer for over 2 years now and the batteries are still running fine. I get around 10 minutes per battery. Each battery is enough to do around 400 linear feet of trimming. The battery will run longer than that but after about 10 minutes power is dramatically reduced to the point where trimming becomes very slow. The 18v NiCad batteries seem to have rapid self discharge. If I leave the batteries for a few days not charging I don't get the most battery life out of them. To get the most power out of my cordless trimmer I find that it's best to put the batteries in the charger overnight right after use. Then 2 nights before I'm going to mow the lawn I recharge one battery overnight. The following day I recharge the 2nd battery and leave it in the charger until I'm ready to use. Before I start mowing the lawn I swap batteries in the charger to top off the 2nd battery in case I need it. The Li-ION battery technology in the Black & Decker LCC220 and Toro 51486 should have improved battery performance. I have a cordless Li-ION drill which I don't use frequently and the battery doesn't seem to drain as fast when not in use. Even months after being left off the charger the drill starts right up. Li-ION batteries also have a different power curve. They provide almost the same amount of power during use. When the battery doesn't have enough power it just stops, unlike NiCad batteries which just slowly become less powerful. I previously wrote about String Trimmers vs Edgers explaining why it's best to use an edger instead of trying to use a string trimmer as an edger. String trimmers don't give as straight or clean results. For edging along my driveway and walkways I use a Black & Decker LE750 Edge Hog about once a month. Because it's corded it takes a little longer to use but it also is more powerful. The metal edging blade also cuts through overgrown edges easier than a string trimmer. Cordless string trimmers just aren't powerful enough to give the same results. The cordless trimmer does a great job of maintaining the edge after every mowing. It will cut the grass that's overgrown but it won't dig into the soil like the edger does. I don't like having to drag out the cord every time I mow so I use the string trimmer. Don't need to be near power outlets. No getting tangled up in cords. Just insert the battery and go. Don't have to store gas and worry about gas and oil mix. Quieter and no gas or exhaust fumes. Even less powerful than electric. Uses thinner line and cannot use blade attachments. I was really woried about using a cordless string trimmer but I am so happy I decided to purchase one. My last trimmer was a corded electric model and I wouldn't use it as frequently. With a cordless trimmer I don't find it a hassle to use it every time I mow. 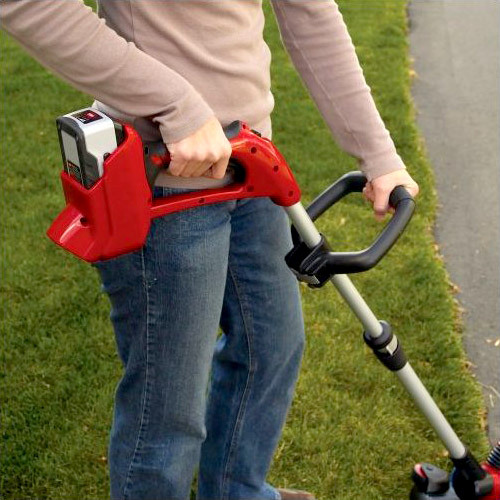 If you use your codlress trimmer as a trimmer and to maintain your lawn's edge in between using an corded or gas edger every few weeks it will make maintaining your lawn much easier. The Black & Decker NST2118 is a newer version of the trimmer I have which I've been very happy with for over 2 years and for some reason is even cheaper than the old model! 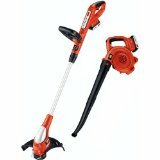 If you don't mind spending a little more go with the Black & Decker LCC220 20-Volt Max Trimmer and Sweeper Combo Kit which uses a more powerful lithium ion battery and includes a cordless blower or for a little more go with the Toro 51486 Cordless 12-Inch 24-Volt Lithium-Ion Electric Trimmer/Edger if you don't care about the blower and want a trimmer whos head rotates and can be used as a walk behind edger.